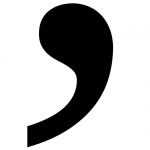 Though for me there is little schadenfreude in witnessing the decline and fall of newspapers, I do find one small cause for cheer in this otherwise unsettling spectacle: the potential resurgence of the serial comma. As Corbett indicates, the argument against the serial comma boils down to this: You don’t need it, and it sounds fussy and ponderous. Although I find that the serial comma sounds more natural, I can buy the argument that it often isn’t necessary for clarity. But even opponents of serialism recognize that, at times, the additional comma is essential. Opposition to the serial comma will not die out any time soon. Many newspaper writers and editor will hold on to their old habits, even as they exchange new media and venues for old. But the decline of newspapers as an institutional influence on writing gives me hope that the serial comma will make slow but steady gains in the new-media world.